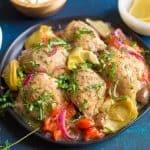 This easy Greek Chicken has so many flavors and textures, it is sure to become a weeknight staple. 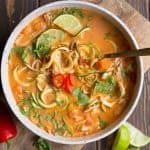 You’ll love how easy this is to make in either the Slow Cooker or Instant Pot! 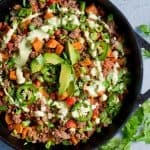 Paleo and Whole30 friendly. Did you all I know I have become the Instant Pot helpline? It’s quite funny, really. Not a day goes by in which one of my friends or family members isn’t calling me or texting me asking me questions about troubleshooting their beloved appliance. In other words, I’ll just call you every time this happens. Thanks friends….Thanks! So here we go today, with a new Instant Pot recipe that I hope is absolutely FOOL PROOF!!! A recipe I hope comes together absolutely perfect for you, as it does for me. And one that will require ZERO phone calls or texts….. I love this recipe for so many good reasons. 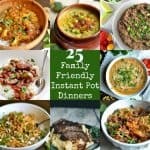 Instant Pot or Slow Cooker for an easy 1 pan dish that requires very little prep work. I’m all about Hands Free cooking! So simple for a busy weeknight. All the additions to the recipe. 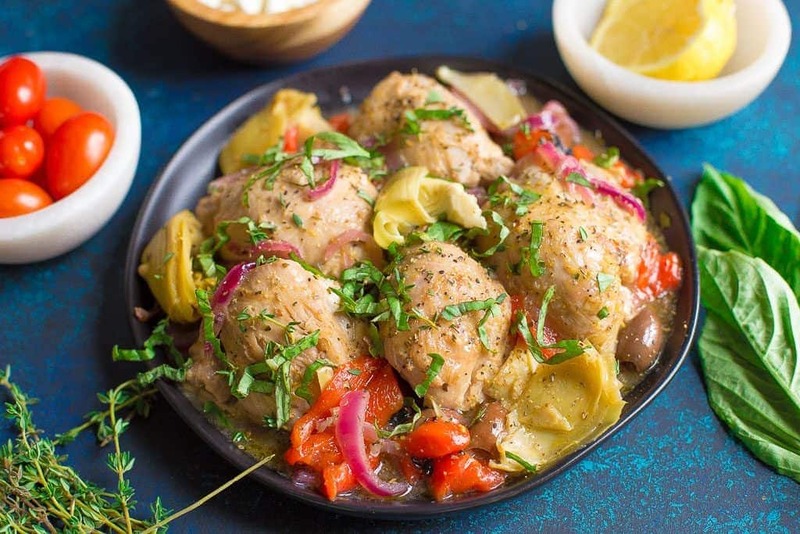 Artichoke hearts, roasted and marinated red bell peppers, olives, and fresh herbs. I’m slightly obsessed with acidic food, can you tell? I love the tanginess of lemon and vinegar, and there is certainly no shortage in this dish! My kids went nuts over this. It might have helped that I served it over potatoes (a favorite side for both of them). 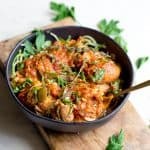 It’s Paleo and Whole30 which makes this a healthy dish to serve in January (or any month of the year). You can even serve with some crumbled feta if not following a strict Paleo or dairy free diet. The addition of fresh herbs is an absolute must!! I topped mine with fresh basil and thyme, even mint would be super fun in this recipe. Several ways to serve this dish, too. I mentioned that we ate this over potatoes, I spiralized mine and roasted in the oven with avocado oil, and salt and pepper. 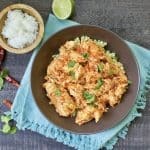 You can also serve over rice or cauliflower rice. 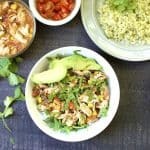 I think it would be perfect with my Cauliflower Rice Tabbouleh! In a bowl, mix together 1/2 cup of chicken broth (don't need the full 2/3 for slow cooker), vinegar, lemon, dried oregano, and dried thyme. Pour on top of the chicken/vegetable mixture. Place lid on top. Select the saute function on your Instant Pot. While pot is heating, salt and pepper each side of your chicken thighs. Add oil to the hot pot, then crushed garlic. Cook for 1 minute, now add chicken. Sear chicken on each side for about 2 minutes (no need to cook all the way through). 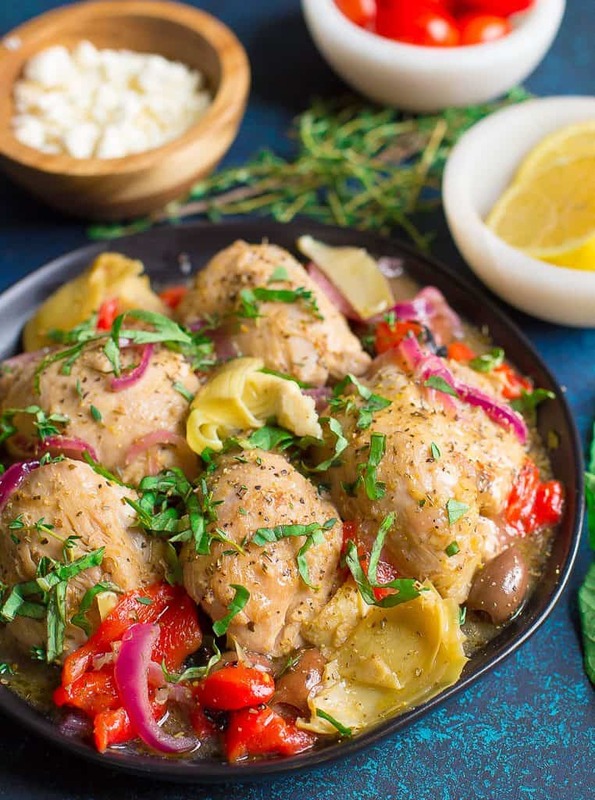 Now arrange the artichoke hearts, peppers, and olives around the chicken filling in the gaps on the bottom of your Instant Pot (if there are any). It's okay to let some of those veggies sit on top of the chicken. Top with sliced red onion. 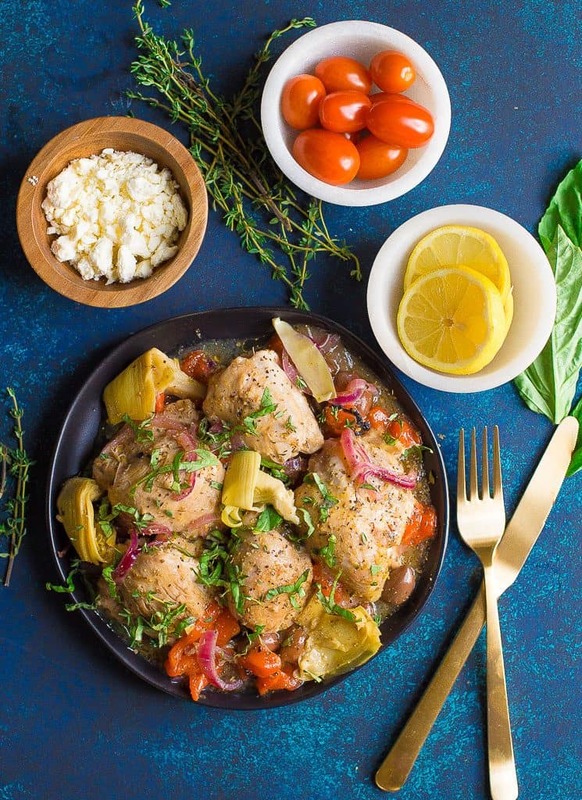 In a bowl, mix together chicken broth, vinegar, lemon, dried oregano, and dried thyme. Pour on top of the chicken/vegetable mixture. Secure the lid. Select the manual function (this may also be called "pressure" on certain versions of Instant Pot). Adjust the time using +- button to 7 minutes (this will cook on high pressure for 7 minutes). Once cooking is complete, use a quick release (natural release is also fine). Be sure to turn your valve down and release all steam before opening the lid. Spoon out some of the juice into a small bowl once cooking is complete. Add 2 tbsp of arrowroot starch to the juice, whisk, and pour back into the Instant Pot. Allow the sauce to thicken for a few minutes before serving. I liked this very much. Had to substitute the olives for capers (used half as much – husband not a fan of olives). The sauce somewhat disintegrated and was very soupy but good. I initially thought 7 minutes in the Instantpot was adequate but perhaps will shorten a bit next time. Cooked on top of stove, not in crockpot or instant pot. Was delicious! Definitely do this again. 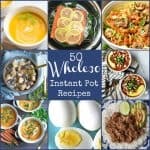 My first Instant Pot recipe! 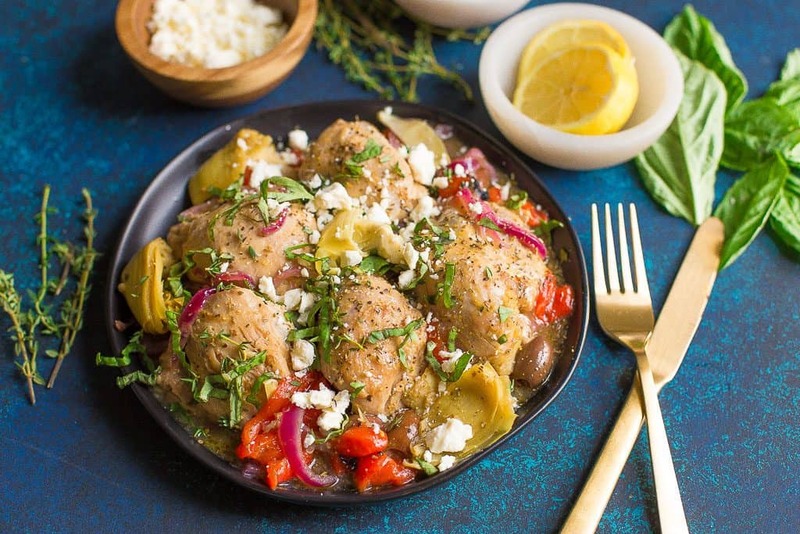 So delicious, and the sauce and vegetables gives a great Greek flavor. why “arrowroot”??? who has that readily available in their pantry? damn, not me! cornstarch or flour?! sheez. It’s a Paleo and Gluten-Free recipe. Flour and cornstarch are not used for people who have dietary restrictions. If you don’t have these dietary restrictions, feel free to substitute.